I have never felt better in my entire life. Dare I say that? Something inside fears I may challenge a contrary part of the universe with such boldness, but there it is. My life is better than I ever imagined. Each morning I sit in my backyard, as receptive to the sun as an Ojai orange, letting gentle morning light kiss every cell of my body, ushering me into sublime states. I’ve been listening to Wayne Dyer demonstrate the power of sound, so I incorporate it into meditation with phases like, the universe dwells in me, as me. I place all limitation in the museum of old beliefs. And, the universe has unobstructed flow through me. I do not limit my abundance. 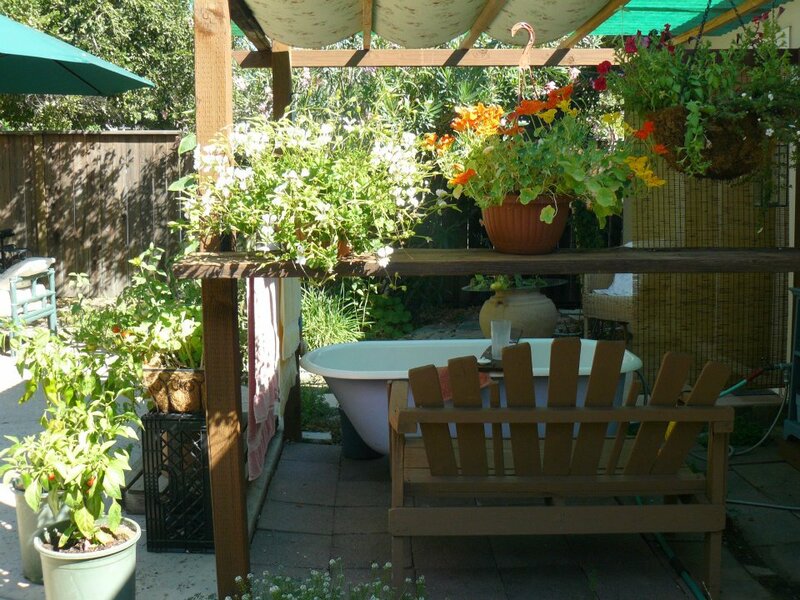 After that I take a long hot soak in my outside bathtub surrounded by trailing petunias, nasturtiums and purple hyacinths. The roof opens into the bluest sky one can imagine – every single day – dotted only by the arrival of scrub jays dipping in and out of a bath of their own. A gift of wind chimes from my sister accentuates the silence, reminding me of our history, bond and love. Blended strawberries, beets, ginger and yogurt propel me out the door and through the wooded bike path to the Athletic club, where I get to swim, stretch or do yoga with some of the finest instructors in the world. One could not imagine a more ideal setting. And when that’s finished, I pedal back home ready to meet whatever the afternoon might hold, with an open heart and grateful spirit. When I saw my acupuncturist last week, she said I had the body of a twenty year old. Well, she’s right because it’s been in storage for decades wrapped and preserved against the cold, my only activity, some Olympic indoor swimming to outrun the devil darkness. But I walk in beauty now. My days are full of richness and a kind of grace and gentle spirit I could only imagine in my former lives. I craved the sun before, complaining to anyone who would listen about its absence. I was depressed and heavy for years, like a plant put in a closet. I withered and become diminished in spirit, never fully comprehending the personal cost. Now, thankfully, all that has changed. I remember my first days in Ojai when I realized that shorts, tank tops and sandals could be daily apparel, instead of fleece, long underwear and sweat pants. Literally ‘seeing’ my body every day was like visiting an old friend I had dearly missed. Well that just sounds so heavenly. I couldn’t be happier for you. As for us northerners, we’ve been blessed with the driest and warmest March in something like 19 years. And some of us thrive on colder crisper air (not necessarily me :o)) Anyway, it warms my heart to hear of your beautiful, happy life. Good for you! May the sun continue to shine down upon you with it’s healing force. I also love your meditation phrases, and use some very similar ones in my meditations. And I can feel your healthy, flexible, smiling self in my soul when I bring you to mind. Lovely to read of your happiness and your “coming home” to the light and love you have found in Ojai. You have created a beautiful life for your mind, body, and spirit. I want to come visit you soon! I miss you!! Karen, beautifully written words coming from a beautiful spirit. To walk free flowing. The heart/soul cry of all of us. The Universe heard! and answered you! Karen, Your writing is graceful and real. I also enjoy returning to my body….